This mural was painted by hand, directly on to all four walls in this average sized room, which was to become the nursery of the clients expected baby. Cute Fairies Mural painted around a whole nursery, with bright colours and the fun characters of the sparkley Usborne Touchy-Feely Fairies book, by Fiona Watt, Stephen Cartwright and Glen Bird. The mural, painted over the whole room in Croydon, took about ten days to paint. Any quote for similar work would be based upon a similar timeframe for the work, depending on the size etc. 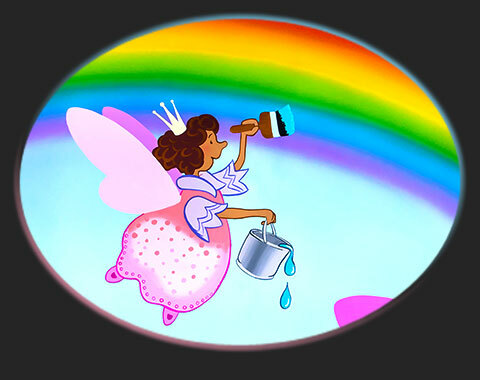 Painting the end of the rainbow and one fairy having fun using it as a slide. The mural, painted over the whole room in Croydon, took about ten days to paint. Any quote for similar work would be based upon a similar timeframe for the work, depending on the size etc. Of course you may qualify for a discount.